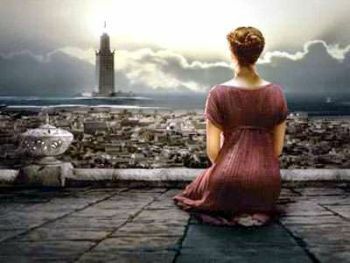 The historical Hypatia was Director of the Alexandria Library and Museoin in the 4th Century A.D., leading at a time when the roles of women in leadership, religious tolerance, cultural diversity, free speech, intellectual exchange, and scientific exploration, were about to encounter the rising power of the Catholic Church. 2014 was the 10th anniversary of the world premier of the play, "Hypatia of Alexandria"
This historical drama was researched extensively by Newburyport author, Kathleen Miller as part of her Doctoral studies in Women’s Spirituality through Westbrook University. The play opens as Hypatia is inaugurated into her new post as Director of the Library and Museoin complex. Her classroom reflects the rich diversity of 4th Century Alexandria, including students from pagan, Jewish, and Christian faiths. Tensions rise after Theodosius declares that all religions other than the Catholic Church are illegal, and Hypatia becomes entangled in the resulting political crossfire. “Hypatia” was selected by an independent panel of judges to be presented as part of the New Works Festival at the Firehouse Center in September of 2004. Miller says “The post-show discussions with the New Works audience provided a lot of fertile material for re-writes, making the play even tighter." "Additionally, I have had the honor and privilege to work with an incredible group of talented actors over the past few months, who have given creative input to the final shaping of this play. Sherry Bonder’s visionary directing has brought in new and unexpected dimensions to the play as well”. Information from entries in the Suda Lexicon.